THE REFERENDUM Commission must begin announcements of the outcome of the August 11, 2016 National Referendum, says Jesuit Centre for Theological Reflection, Father Leonard Chiti. 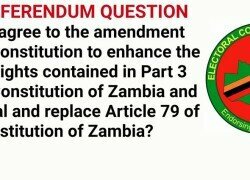 Father Chiti said it was general knowledge that the Electoral Commission of Zambia (ECZ), which is also the Referendum Commission, should have been carrying out the referendum announcements alongside the general elections results. He said the Commission had the referendum results and wondered why they had not yet started announcing results as they were doing with the general elections results. “I am sure they have the results because they are coming from the same polling stations as the results for general elections. “I know for a fact that they just need to add the ballots and announce the results. I am a little surprised that they are not doing that,” he said. There has been concern about the response of voters to the referendum and the subsequent participation as many people complained of lack of sensitisation about its importance. Father Chiti, however, expressed confidence that the commission should soon be able to disclose the results from the referendum vote, which should be based on a simple majority of either YES or NO for a successful referendum.